Osmace, Bosnia And Herzegovina, May 16, 2009. 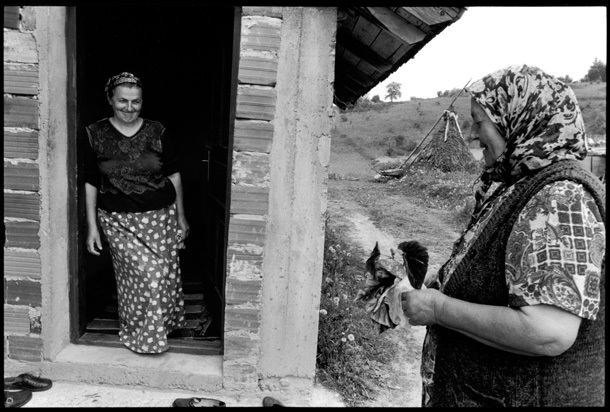 The town of Osmace, near Srebenica, is now called “The Village of Women” because most of the husbands and brothers of the women who live there were killed in the war. Out of necessity, these women took over many of the men’s roles: working the fields, rebuilding homes, tending the animals while raising their children born prior to the war. These two women, Sadeta Krdzic (left), 45, a Bosnian Muslim whose husband was killed, now lives with with her husband’s aunt Saheza Krdzic, 59. They said it is less lonely living with each other and they can share the work.